A Ghost City is the larger version of a Ghost Town, and is used in visual media as shorthand for 'something terrible has happened'. A city typically contains millions of people, and the viewer knows that only the hugest of disasters could completely clear it of its inhabitants. Always characterized by newspapers lining the streets, shuffled about by the wind (usually with headlines alluding to the disaster), the urban counterpart to a Ghost Town's tumbleweeds. Besides newspapers, other classic signs of abandonment may include blinking yellow light on a crossing, or an arc of sparks from a street light (though their electrification raises Fridge Logic). Usually there is one person, or possibly a few people, left to contrast the vast emptiness. Often the first indication that this is, in fact, After the End. May be the first sign of a Ghost Planet. If such a setting is peaceful and non-threatening, it may be a Beautiful Void. Kino comes across one of these in Kino's Journey, with only one inhabitant. It turns out that the country was destroyed by rabid democracy following the death of a tyrannical king, as only direct vote by the entire people was seen as accepted way to make decisions, and the losing side was always deemed as "dangerous elements", and executed. Krakow in The Sky Crawlers seems like this, presumably because it's very late at night, and for stylistic reasons. The only thing moving in the dark streets is the tram that brings the protagonists in, the bowling alley is near-deserted and the only person in the restaurant apart from the main characters is the silent and almost invisible waiter. The deadly game of Hide and Seek from Kakurenbo take place in one. It's for a good reason. Green Lantern has Coast City, which was rebuilt, but no one wanted to live there after the Henshaw incident. Ehndris in With Strings Attached. 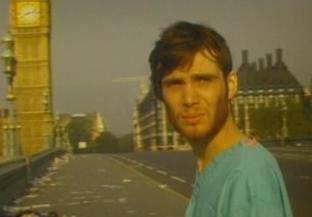 This was filmed in the early hours of the morning in Real Life London. Much of the centre of town, especially the City, empties out at weekends and during the night. This scene was a homage to the opening of Day of the Triffids (see Literature below). A very derivative use pops up at the end of Alone in the Dark, just before the heroes get attacked by - even more derivatively - the camera. The Last Man On Earth (1964), The Omega Man (1971) and I Am Legend(2007), all based on the same book. The Omega Man, similar to 28 Days Later, achieved the look by filming on location in suburban L.A. early on Sunday mornings, when there was little traffic to speak of and most local businesses hadn't yet opened. Land of the Dead, a sequel to the more famous Night of the Living Dead, features the struggles of humanity, who have managed to fortify a city against the dead and are relatively safe. However, an early overhead shot shows the tiny number of humans in a city made for millions. The film version of Silent Hill was inspired by the Real Life example of Centralia, Pennsylvania. Vanilla Sky (2001), but this is a case of it all being in his mind. Near the end of The Devil's Advocate, when the main character goes to meet with Satan, the streets of New York are completely empty. The final scenes of Kairo/Pulse, in which the heroine drives across a deserted Tokyo. In Contagion, eventually the cities end up looking like this, with uncollected trash and only the occasional hazmat suited person as everyone is either staying in their homes or dead. Shadar Logoth in The Wheel of Time. Night Work (German: Die Arbeit der Nacht), a novel about an Austrian man named Jonas who woke up one morning to find the world empty of (non-plant) life. In J. G. Ballard's Chronopolis, the titular city used to have a population of over a billion, with everyone divided into shifts to prevent total chaos when they tried to go to work (or anything else). The fall of the city caused timekeeping to be forbidden, and the main character learning how it works starts the plot. London, following an epidemic, in John Christopher's Empty World. Many examples in the Freeway Warrior series. Dean Koontz's novella Strange Highways: Coal Valley, Pennsylvania was inspired by the Real Life example of Centralia, Pennsylvania. Brendan DuBois' novel Resurrection Day: In 1972, New York City, along with a good chunk of New Jersey and New York State, is completely deserted and cordoned off by the US Army as a result of 3 Soviet nukes that hit Queens, Idlewild (JFK) Airport and Orange New Jersey (bomber missed Newark Airport) in 1962 when the Cuban Missile Crisis escalated into World War III. However, later in the novel it is revealed that many residents never left, and some even came back, and now live underground in a 'free' society compared to the rationing, censorship and drafting still ongoing in the USA. The Army knows but seemingly doesn't care, but still keeps it secret. In The Old Kingdom, Sabriel travels through two cities that have been mostly deserted because of the Dead. During the day, they're Ghost Cities and at night they're crawling with Dead. In both places the survivors found a part of the city they could fortify against the Dead (who don't like running water) and are living there. London again, in the opening of John Wyndham's The Day of the Triffids. The protagonist wakes up in a hospital after 10 days in a coma, and finds the building and most of the nearby streets deserted. That would be the (poor) 1960s film - in the book, Bill Masen has his eyes bandaged because of a Triffid sting and misses the flashing lights that blind everyone else. The dead city part doesn't come until much later in the book when all of the blind have died off and he revisits London for supplies. In A Song of Ice and Fire, Daenerys Targaryen and her few remaining people after Drogo dies cross the vast desert of Red Waste when they find an abandoned city, which is a good thing because they find water and food there. They don't stay for long though. Buffy the Vampire Slayer Season 7 has Sunnydale become this so that they can have a No Endor Holocaust ending. Played with in "Voyage of the Damned" (new series Christmas special), where London appears to be a ghost city populated by a few trigger-happy residents. It turns out that people have gotten so used to horrible things happening every Christmas that they decided to stay out of town for a few days and avoid all the fuss. Red Dwarf "Tikka To Ride"
Stargate SG-1 episodes "Bane", "Ascension", "2001" and "Menace". Season 1 and 2 of Battlestar Galactica Reimagined featured plenty of these as Sharon and Helo made their way to Delphi. While major cities like Caprica City were nuked properly and thoroughly, other cities such as Delphi and several unnamed ones were surprisingly intact. It is later revealed that the Cylons left these cities intact deliberately so that they could settle. Life After People shows what would happen to all those ghost cities as they slowly revert back to the wild. British TV series Survivors depicts a world where 99% of humanity are wiped out by a rogue virus, leaving hundreds of pristine but abandoned cities. The cities are largely avoided however, due to the health risks of the millions of unburied bodies. Delirium does a musical example that combines this with Tear Jerker. Hashima Island of Japan. It was once one of the most densely populated areas in the world, and its main industry was mining. Eventually, the industry died, causing it to suffer the same fate as many other real-world ghost towns. It gets extra horror points for the fact that it was the site of forced labor by Korean prisoners during World War II. The city of Prypiat, Ukraine. Once had a fairly large population, until Chernobyl had a meltdown and the whole city was evacuated. "Fifty thousand people used to live in this city. Now it's a ghost town." For what it's worth quite a few people do live there. A lot are elderly residents who refused to move or snuck back in. Others are refugees from the former USSR. There is also some real deal STALKER type looters and vagabonds. The town is practically bustling at the moment, as a new radiation shield is being built to replace the old one in the infamous power plant. A lot of big cities on the weekends, i.e. Dallas. Or conversely, late on weekday nights. Varosha, the resort quarter of Famagusta, Cyprus. It was one of the world's most popular travel destinations until 1974, when the Turkish military seized control of the area and forced out the residents. Today it remains under military occupation, the crumbling beachfront motels cordoned off with barbed wire. New Orleans in the immediate aftermath of Hurricane Katrina. They got better! Greater Houston during Hurricane Rita, before the storm moved north, due to the largest mass movement of civilians during peacetime. Any hurricane will result in a portion of the population moving to higher ground, helping to fulfill this trope for localized areas, but after seeing what happened to New Orleans the Houstonians understandably wanted to avoid it. To this day local citizens are still divided on whether to refer to 'Texodus' as an understandable precaution, a dry run for the next Cat 4/5, a panic induced fiasco, or a combination of all of the above. The Ghost Cities of China are an unusual case in that they're not the result of any disaster: the Chinese government gives incentives to huge construction projects in order to achieve GDP growth targets and speculation causes property prices to be too great for the majority of the Chinese population to afford. The result is entire cities full of houses that have never been used. There are at least 35 of these in and around China. The government plans on building at least 20 cities a year for the next twenty years. A good part of Manhattan looked like this after people were told to evacuate when Hurricane Irene was passing through. For the first time in ages, there was a huge reduction in traffic jams due to everyone evacuating or staying home. The Financial District looks like this most weekends, unless they're taking advantage of that to use them as a film set. The ruined cities in GURPS Reign Of Steel that are too small for the AIs to bother with. Pretty much every major city in Deadlands: Hell On Earth, due to ghost-rock bombs that kill everything around them while leaving the infrastructure more or less intact. Does not apply to smaller cities, which were usually hit by conventional nukes and obliterated. The completely empty ruins of a nameless city, implied to be the once-bustling Stygia, the capital of the kingdom of the Western dead. Necropolis New York City, where the maelstrom was so powerful it actually fused all of the ghosts within with the ruins of the city itself. Some areas of Fallout 3. There are many depressing apartment buildings that the player cannot access, and there aren't any raiders or mutants anywhere to be found, just dirt and crumbling buildings. This is very prominent in the DLC where the Player goes to Pittsburg. The city backgrounds in Mortal Kombat 3. Also, the end of the first Resident Evil movie. The end of Doom, and the middle part of Doom II. Silverspring from Heretic and Heretic 2, first time because of a evil wizard and his army, second time because of a magical disease. The Kingdom of Sorrow in Klonoa 2: Lunatea's Veil. The city of Fairport is turned into one of these in the F.E.A.R. series. The fate of most cities on Gran Pulse in Final Fantasy XIII. The sequel game implies that there may be more to the planet than the heroes originally discovered, however. Along with the example of Prypiat mentioned in the Real Life section, Modern Warfare also has a second one briefly when a nuke sets off in the capital city at the end of "Shock and Awe" - the last images that Sgt. Paul Jackson sees before succumbing to his injuries is of a ruined, eerily silent city that maybe ten minutes prior was awash in fierce gunfire. Even though nobody saw the russian invasion in Modern Warfare 2 coming until the first wave of planes was already in the skies over Virginia, by the time American forces arrive in Washington, the city has been completely evacuated with no signs of civilians anywhere. World of Warcraft features Gilneas City, emptied out like the rest of Gilneas following the Forsaken invasion. In Shifters there are several examples of this trope. Many sections of The Undercity (beneath the Mega City where the comic is set. Whole towns were covered over by the growth of the MegaCities and were effectively abandoned. Further there are many cities and towns in the areas effected by the "Nuclear Incident" that gave rise to the MegaCities themselves which are now empty of all life. In The Gamers Alliance, Dar'Cenrath, the capital of what became known as the Ruined Kingdom, ends up as a ghost city when its population is wiped out by a destructive spell. The heroes of the Grand Alliance visit it hundreds of years later, and it ends up playing an important part as the birthplace of the Godslayer as well as the prison of the mad god Shakkan. This page was last edited on 5 November 2018, at 21:26.